Screw Distributors are suppliers of high quality products. This extends towards their screw anchors and other fasteners. We stock a variety of anchor screws intended for a variety of purposes. As such, those needing to buy anchors need not look further than Screw Distributors. The types of anchors and anchor sizes we have available can fulfil most requirements. Additionally, we dedicate ourselves towards ensuring their correct usage. Thus, we have provided relevant information on their usage below. Screw Anchors are otherwise known as wall plugs. Other types of fasteners use them as attachments. Specifically, they are useful when a fastened material may not support the weight of the screw on its own. For example, a lot of masonry is too brittle to allow for the installation of fasteners on their own. But, these anchor screws also play other roles, mainly as support for a system or structure. Drop-in Anchors are mainly used in the installation of threaded rods into ceilings. These generally come available in many different anchor sizes. As such, these screw anchors are primarily consumed by the building construction industry. As such, when needing a flush mounted concrete anchor, the drop-in anchor is useful. This is because it provides a tight and sturdy fastening that is bolt-able and unbolt-able. On top of this, the design of types of anchors allow them to reset if they slips or are not fully set into their fastening. If you’re looking to buy anchors of this type, visit our product page here. As anchor screws go, Spring toggles are also known as butterfly anchors. are screw anchors that include a spring-loaded wing design. Their design allows them to hang light loads from thin materials such as ceiling boards. These anchor screws are also available in many anchor sizes. They are excellent choices for builders that need a more concealed finish. Keep in mind that the wings on the spring toggle need to be flat before insertion into its premade hole. If you’re looking to buy anchors of this type, visit our product page here. 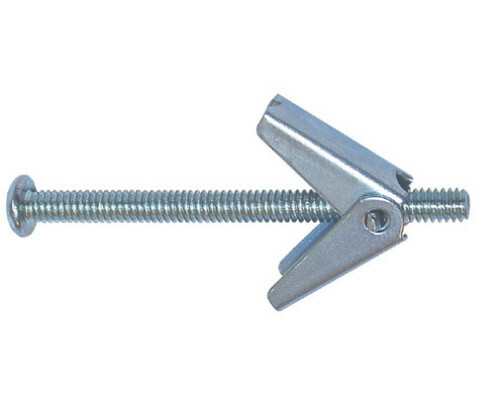 Sleeve anchors are types of anchors used for fastening medium-heavy loads to walls and floors. Pre-drilled holes are necessary in its installation. And, once placed into the hole, you must tighten the nut on these types of anchors. This expands the sleeve, allowing for a tight fit and sturdy fastening. Keep in mind, you use these screw anchors for push-through and static applications. As well, the object that needs fastening must have the same sized hole drilled into it as the surface. If you’re looking to buy anchors of this type, visit our product page here. 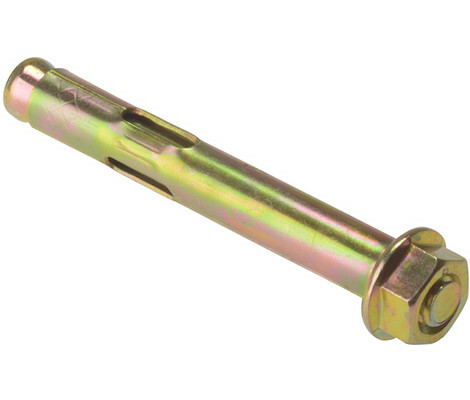 Nail-In Anchors, available in many anchor sizes, are ideal for as many applications. They are sleeves generally made of plastic or nylon. They allow screws to fasten objects into masonry. After drilling the hole, insert the sleeve. Then, the installation of these anchor screws expands the sleeve, exerting force. This allows for a stronger fastening. In specific usage, it’s important to note that plastic nail-in types of anchors are better suited to interior use. They are also recognisable by their white colour. 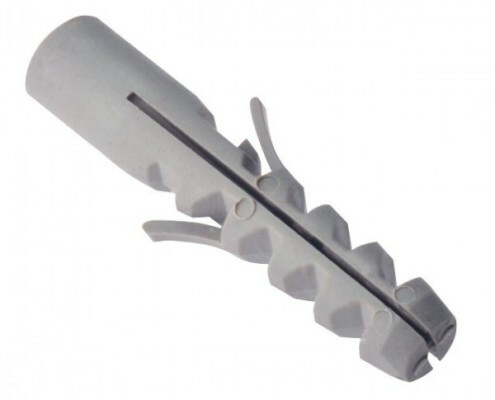 Nylon nail-in anchors are for exterior applications, identifiable by their gray colour. If you’re looking to buy anchors of this type, visit our product page here. 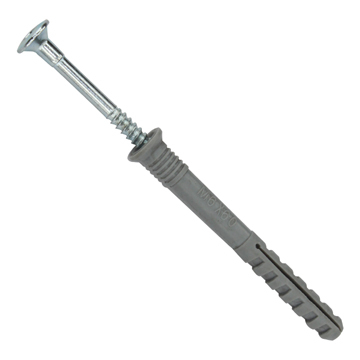 These screw anchors are primarily used to fasten various materials to concrete. In fact, they are usually the best choice for those looking to anchor into solid concrete. Their holding ability means that they’re useful in a variety of applications. When installing these anchor screws, be certain to use the correct anchor sizes. Diameter and length need to be correct to ensure that it is properly and safely installed. If you’re looking to buy anchors of this type, visit our product page here. Wall plugs are types of anchors that share a similar role to nail-in anchors. They are primarily used to allow screws to fasten objects to masonry while providing a sturdy, long-term holding solution. If you’re looking to buy anchors of this type, visit our product page here. Screw Distributors have established a reputation for excellence in the supply of fasteners. Our industry knowledge matches our dedication to excellent levels of service. This means that we are able to meet the needs of our customers as per their specifications every time.